I want to turn the knobs to 10, but my job position doesn’t allow me to dictate that my team do so. Even if it did, forcing XP may serve only to cause resentment and backlash. Though I’ve been learning XP for over a year, it’s still new to the rest of our team, and we’re used to our old habits. By giving team members control of how extreme to be through a ’teaching survey’, the team has started at a comfortable level of XP and has opened the door to future extremes. We’ve used the survey to define, coach, and track our XP process and have increased our use of XP by 10% in three months. Wake, William. XP Radar Chart. 2001. Web Site On-line at http://www.xp123.com/xplor/xp0012b/index.shtml This is an important article to read to see how to check for ‘unbalanced’ levels of adoption between XP practices. Williams, Laurie. Multiple papers on Pair Programming. WebSite. On-line at http://www.pairprogramming.com This site has links to Laurie Williams’ key articles on pair programming. Jeffries Ron, Editor. Xprogramming.com 2002. Web Site. On-line at http://www.xprogramming.com This site has a good introduction to XP in general but also the relationships between the practices. 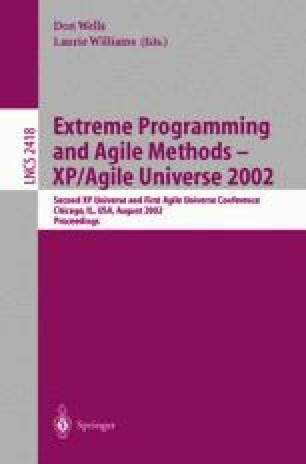 Kerievsky, Joshua: Continuous Learning, Paper at XP2001 http://industriallogic.com/xp/ContinuousLearning.pdf This paper give specific ideas on how to help the team learn and continue learning. The study group idea in particular would fit well with the grass roots survey approach.